Gaza terrorists publish video of Zamir at southern border with telescopic sight trained on him. 'General Zamir within sniper unit range'. 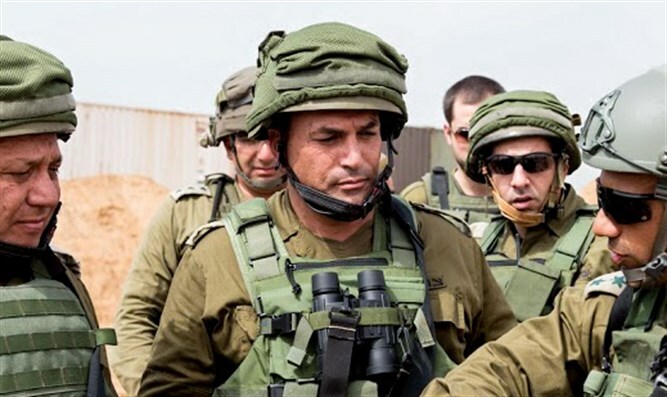 The "Mujahedeen Brigades" in Gaza published a video in which Southern Command chief Eyal Zamir is filmed alongside other officers and soldiers on the border of the Gaza Strip, reported Kann Channel 10 news. A video posted on their Facebook page read: "Soldiers and General Zamir within sniper unit range". Channel 10 reports that the Mujahedeen Brigades, a breakaway from the Al-Aqsa Martyrs Brigade, the Fatah's armed wing in Gaza, published a clip today in which they threaten Southern Command head Eyal Zamir. The IDF is checking the video's authenticity. The clip shows Zamir at a briefing on the southern border with a telescopic sight trained on him. The clip includes personal details of Zamir and claims the organization could hit him.